A loan agreement is a contract between a borrowing party and a lending party, such as a bank or other financial institution. A loan agreement is a contract between a borrowing party and a lending party, such as a bank or other financial institution. There are many different types of loan agreements, however, they all follow a similar pattern. This agreement will protect both parties during their financial transaction, whether it is related to real estate, business, or other finances. The loan agreement will typically have detailed information about the borrower, including their personal information, creditworthiness, income, and expenses. This information is required in order for the lender to determine if they are willing to proceed with the transaction. The last section will detail the information about the loan, including the term for the loan, the interest rate, the total amount of the loan, and other financial specifics. Loans are a common part of day to day finance in our society. Some are large loans provided by banks for home buying or education, while others are to consolidate student loans, or for the purchase of automobiles. The most frequently used type of loan is much smaller in size. These small or personal loans often occur between small businesses and individuals, or among family and friends. It is often said that loaning money is the fastest way to ruin a relationship; however, when you follow a sample loan agreement, you can head off many problems. When you loan any amount of money, be it two hundred dollars or two thousand, it’s important to fill out and sign a loan agreement template. Why should you use a free loan agreement template when loaning money? Because of what can happen when you don’t. When loan agreement templates aren’t followed, the lending party can lose some or all of the money owed with no certain legal remedies. Without following a sample loan agreement, you can also not enforce when the loan is to be repaid; in fact, you could find yourself waiting for years for repayment. In legal cases involving loans without loan agreements, the court has to try to determine who is telling the truth about the terms of a loan, or even if a loan occurred. Even if you are lending to family or a friend you are certain would never cheat you, it is important to complete a free loan agreement template. This loan agreement can work to not only protect your loan, but also the integrity of your relationship. Also, it tidies up the loan by setting out payment requirements. Is the loan to be paid back in installments, or all by a certain date? Is there any interest being charged on the loan, or late charges if the loan is not paid back? While these may not be things that lenders want to consider when loaning to someone they trust, it is important to protect both parties when lending money. If the person borrowing the money will not be able to pay it back for several months, they might feel more comfortable with the protection of a loan agreement template that states that prior to the exchange of funds. Filling out and signing a free loan agreement template takes very little time and effort, but can prevent many legal and personal problems later on. 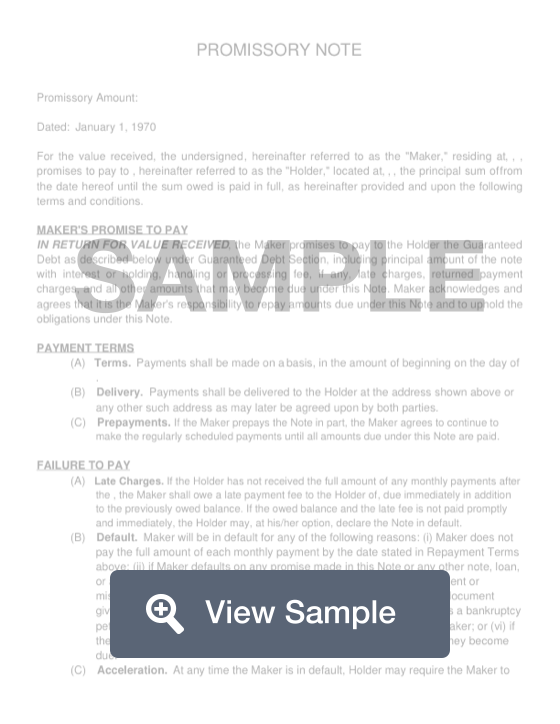 Create a free Loan Agreement in minutes with our professional document builder. Here is our guide to loan agreements. There are many different types of loans for many different situations. We begin here by looking at loans between friends and family. We cover what to consider before entering into such an agreement, as well as how to make sure both parties are protected. From there, we cover important things to know about several different loan agreements, including home loans and small business loans. We end by discussing your options for amending or restructuring bank loans. Loan agreements prevent lenders from being cheated while clearly explaining loan terms to protect all involved parties. A well-crafted loan agreement should clearly define all components of a loan. You want to make sure the language you use prevents any possible misunderstandings. Loan agreements should make clear that a loan is not a gift. They should, therefore, detail payment requirements--frequency of installments, full repayment date, late charges, etc. IOU: the simplest and least formal of these three agreements. IOUs typically do not require interest on repayment, and merely require the borrower’s signature for formalization. Promissory note: there are two types (secured and unsecured). Secured promissory notes include collateral terms--items of value the lender can take if the borrower defaults. Secured notes also may include interest. Loan agreements: the most formal of these three agreements. Loan agreements are generally used when the transaction involves a substantial sum of money. Loan agreements also enable lenders to charge late fees and other penalties for late payment. They can also include joint and several liability--which holds all borrowers responsible if a single party does not repay the loan--and a right to transfer if the lender wants to transfer the loan to someone else. The options outlined above provide lenders with varying degrees of formality when lending money. Therefore, choosing the right lending agreement for a loan arrangement will help protect you as a lender, while also, hopefully, preserving business and personal relationships. Lending money to friends or family can be challenging. On one hand, you want to help those close to you in times of financial need. On the other hand, you want to make sure you are not taken advantage of and that your loan is repaid. It is important to keep in mind that if someone close to you cannot acquire a personal loan from a bank, this borrower is likely a greater credit risk. Money to help someone rebound after a divorce, illness, disaster, other emergency situation etc. Just because you can lend family or friends money, does not mean you should. Here’s a list of considerations to help you decide whether or not it is a good idea to lend to loved ones. Can they (friends or family) get a bank loan? Even if the borrower has bad credit, there are options for personal bank loans. However, these loans come with higher interest rates. Therefore, if the borrower does not need the money immediately, and you are uncomfortable lending money to a friend or family member for fear they will not make regular payments or any for that matter, it might be best for the borrower to wait, focus on raising their credit score, and then reapplying for a bank loan with better terms. What impact, if any, will lending this lump sum of money have on your savings and retirement goals? Is that a risk you are willing to take? Also consider the tax implications of a loan, which may be subject to a gift tax (if you do not charge interest). If you do charge interest, be sure to follow IRS guidelines regarding the rate and report it when filing your taxes. For borrower: no credit check, lower (or no) interest, flexible monthly payment and payback terms. For lender: can help a loved one in need, or aid a young adult in learning about financial responsibility on a scale with fewer consequences. For borrower: the inability to repay or pay on time may strain family relationships. For lender: if you are inclined to loan friends and family money merely out of kindness, you may place your own financial security in jeopardy. Charge a fair interest rate: the IRS Applicable Federal Rate (set monthly) should serve as a floor for any interest rate you charge. Also remember, if you lend someone more than $12,000 a year it may be considered a gift by the IRS which might require gift taxes. Make sure to have a signed legal agreement: a signed legal document will help protect you in the unforeseen event of nonpayment. Furthermore, if you are loaning a large sum, you may want to have an attorney draft the agreement. Make sure you include how much money is being borrowed, the terms of the loan, interest rate, how late payments will be dealt with and how payments will be made. Determine if this is a secured or unsecured loan. In a secured loan, the lender holds title to portions of your property until repayment. As previously mentioned, if you lend someone more than $12,000 a year, it may be considered a gift by the IRS and you may, therefore, be subject to gift taxes. A written loan agreement, which proves the money is not a gift, is your best protection against gift taxes. If you wish to give a no-interest loan, make sure it does not exceed $100,000 because the IRS can charge market-rate interest or “imputed interest” on the lender for any amount above $10,000. No interest is imputed for loans less than $10,000. For loans between $10,000 and $100,000 - the imputed amount is based on net investment income. The IRS uses the applicable federal rate (which changes monthly) to determine the interest rate on relevant transactions. Lastly, you cannot deduct the interest you pay on a loan from family or friends if the details of the loan are not written in the loan agreement. Furthermore, the lender will not be able to take a tax deduction on the loss if the borrower fails to pay. If the borrower is unlikely to be able to repay the loan under its current terms, the lender may modify the agreement to ensure repayment. The modification can reduce the interest rate on the loan, extend the loan term length, or change the type of loan (or a combination of all three). A loan modification is a long-term solution, not a short-term solution related to a short-term financial hardship. Home loan agreements are typically very long (around 50 pages), so it is important to know what to look out for in case there is anything suspicious in your agreement. Interest rate reset clause: after a certain period, the fixed rate home loan converts to a floating rate loan. Under reset clauses, banks may review interest rates and reset them based on market rates at their discretion. Assignment to third parties: affords home finance companies the right to hire third parties to collect payment without permission of the buyer. Notification clause: buyer must provide lending institution substantial notice of changes in personal status (loss of job, divorce, marriage). A clause allowing amendments: borrower must ensure that written consent is required to alter terms of the loan contract. Security cover clause: lender may ask the customer to provide additional security to safeguard the outstanding home loan balance. Rate of interest: fixed or floating. Finance charge: the finance charge is the cost of credit. The finance charge section will include associated charges required in order to receive the loan in addition to interest, such as document preparation fees. Annual percentage rate (APR): the interest rate paid to a creditor on a yearly basis. This includes all expenses (interest, origination fees, discount points) and is the amount you should use to compare loans. Schedule of payments: the number of payments, the amount required for each payment, and when payments are due. Total payments: total amount you will pay if you make all scheduled loan payments. Loan agreements are complicated arrangements that require substantial financial literacy. In the case of loans between loved ones, loan agreements also require the navigation of complex personal dynamics. Whether you are considering loaning money to a friend or family member, ensuring you fully comprehend a home loan agreement, or are looking to modify a bank loan, we hope this guide provides you a greater understanding of loan agreements.